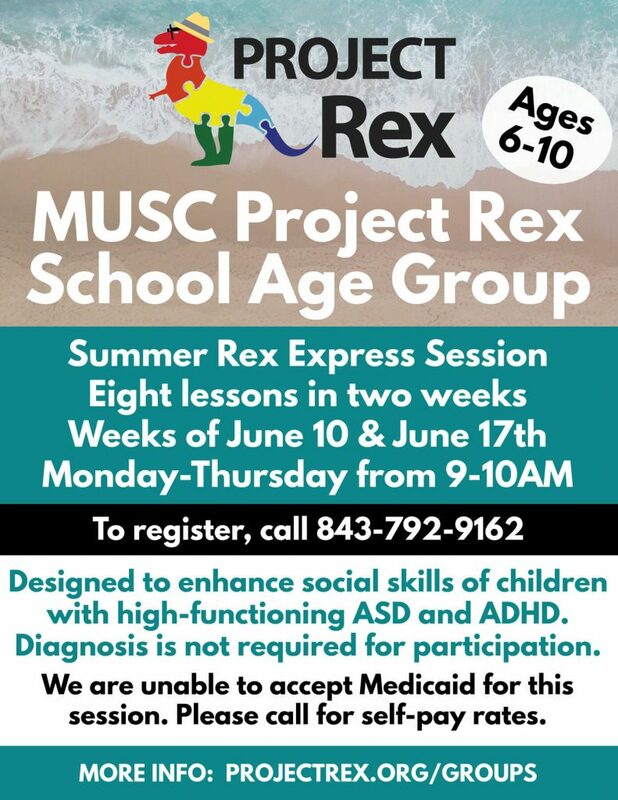 A special “Rex Express” summer session of the School-Age group is meeting Monday to Thursday from 9AM – 10AM during the weeks of June 10th and June 17th. Intake is required before participating in the group. Please call (843) 792-9162 to confirm attendance. This group is designed to enhance social skills of children with high-functioning ASD and ADHD. Diagnosis is not required for participation. Social skills are introduced through social stories and include greetings, conversation skills, types of social relationships, boundaries, managing frustration and anger, and more. Groups include sensory and gross motor activities to enhance play skills. Note that a mandatory parent group meets at the same time as this group. To schedule an intake, call (843) 792-9162 and request a Project Rex Assessment. Once the intake is complete, contact administrative assistant Lavinia Bowens at (843) 792-0037 to confirm attendance in the group series. Please plan to arrive 15 minutes early to each group meeting for sign in and registration. We are unable to accept Medicaid for this session. Please call for self-pay rates. Want to help us spread the news? Share the flyer below on social media or access a print-ready version of the flyer here.